Co-owner of Toronto’s BarChef – rated by Food and Wine Magazine as one of the “top seven new and innovative bars in the world” – Frankie Solarik is a pioneer of the Modernist and contemporary approach to cocktails internationally. Solarik's work has earned him international acclaim, being featured in The New York Times and on CNN, as well as a guest judge spot on The Food Network's popular competition program, "Top Chef Canada." He has been profiled in major national magazines, newspapers and television shows, including The National Post, WG Magazine, The Globe and Mail, Imbibe Magazine, Sharp Magazine, Global TV, City TV, BNN, and CBC. 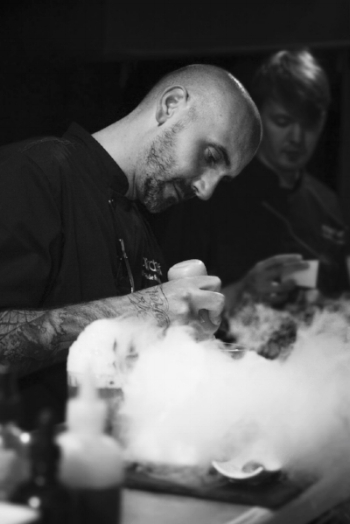 Although many of his signature dishes feature complex flavours and spectacular presentations, employing everything from frozen carbon dioxide to hydrosols and blowtorches, at their very core the compositions depend on a "less is more" approach; a process rooted in balancing components that complement each other rather than contrast, regardless how many ingredients he is working with. His approach is unique, his research impeccable. His colossal goal: to inspire others worldwide to adopt a completely new outlook in cocktail culture and to dramatically expand on the Modernist movement. Brent VanderVeen is the co-owner of BarChef, responsible for the design, development and management of the bar. Together with Frankie Solarik, VanderVeen coordinated the creation of BarChef, including the development and execution of the business plan, hiring of all professional trades, and the management of ongoing operations. VanderVeen is an accredited sommelier. Before making his vision for BarChef a reality he worked in all aspects of the restaurant and bar industry including serving, bartending, and managing; however, his passion has always been spirits.